Over the passage of time, mens fashion has changed significantly. These days, several styling on the men's attires are getting to seen which are purely modification on the conventional styling. The usage of the beading works is nothing new in the designing of the attires. Since the earliest of the times, the beading works on the attires had made it to look extremely classy. However, the usage of these decorative items was more common in women's fashion. The fashion designer after felling that some new incorporation is needed to be made in men's fashion, imported the idea of using beads or other ornamental disks as decorative upon the men's attires too and this gave birth to one of the most popular number of today's time, the mens sequin jacket. The mens sequin jacket are the ones that comes with ornamental beads or discs sewed upon the jackets. The jackets are one of the most sought-after items in men's fashion. Being lighter in weight, these dresses offer the ultimate comfort to the wearer while its delightful show glam up his appearance manifold. Once these beading works are laid over the jackets, the show on it turns more stupendous, making it the perfect pieces for the fashion conscious men across the lighter mood events and casual ambiance. These sequined jackets are even used in formal gatherings wherein these clothes retain the gravity of the traditional formal dresses and this improvisation on its look blends it with great styling. These sequined jackets come in effects wherein the colors for the base and the beading materials are in contrast to each other. The dress manufacturers use various materials for this beading works that can even be metallic too. The most commonly used beading materials come in plastics. Since these are tiny and lightweight materials, the wearer can be assured that it would never lift the weight of the clothes. The tailcoats are the ones with cut-away design along the frontal face that leaves the rear portion, appearing as to be a tail. This style of coats is not something that had evolved recently. Rather these attires are in use among men from centuries earlier. The term is used a synonym to the dress coats. These coats suffice a wear both during the day and the evening times. The designer had actually retained the spirit of these coats that are meant to serve utility and convenience in movement and held it up with striking colors that made the red tailcoat jacket to evolve. Red is the shade that displays authority and power. 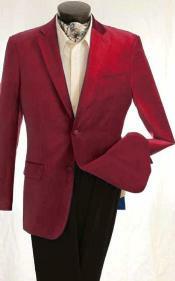 Shaded in the reds, the red tailcoat jacket comes as a reliable attire to uphold the wearer's grace of masculinity. If paired with the perfect fashion accessories and worn across the appropriate events, mostly formal ones, the wearer can be assured that these jackets would give him a look that would easily attract the notice and interest of the crowd around him. One can get the perfect piece for himself within affordable budget should he invests some time to search over the online stores. The addition of numbers like the red tailcoat jacket or the mens sequin jackets had bring a complete new orientation in men's fashion. With these impressive numbers, the modern fashion conscious men are now empowered to make each of their public appearance in the most impacting style.